You are (virtually) looking at a girl that can't help but look for the absolute cheapest option for things (most of the time. Random splurges on J Crew and Nine West notwithstanding). It bugs me when I lose out on an extra few dollars of a sale here, or forget my coupon for the freebie dinner there. That being said, I look for quality in most things I do and buy. I am not about to give up the good life in return for that extra buck. The perfect balance is somewhere right in between frugality and fabulousity. The guys out there know that they can always charm us gals with a great date night. For girls like me, however, if it is a weeknight date night, I get an extra surge knowing that it's a good use of our time AND money. Call me silly, call me obsessed, I don't care. If you take advantage of that fun Groupon while I am with you, I will think you nothing short of genius. I came across a random folder while doing some (overly-compulsive) spring cleaning last week. It's bright yellow color caught my eye first, and then the handwriting on the front. Mine, of course, but more so what it said -- "Things to Do and Fun Extras!" Oh, how simple my life once was before the days of Reader, instant 365 Things to Do emails and Scoutmob tweets. I, at one time, pulled interesting articles from magazines and newspapers and stored them right there, in my own file-able inspiration board. Among other cute things stored within it's pockets, the folder held two similar articles that I thought particularly timely this week, even though I pulled them out of the AJC circa Summer 2007. What is timeless about them is that they are the kickoff to the perfect, cheap and worldly date night -- actually, make that 100 date nights, all of which can impress for both high quality and budgetary reasons. May I present the American Film Institute's Top 100 Greatest Films OF ALL TIME. And not just one version, but two -- an updated list from 2007 that adds to the original list published in 1997, and a version that breaks out movies into genres. Pick a movie that you or your significant other haven't seen. Alternate choices each time you pull out the list. Or close your eyes and point and see which one comes up randomly. 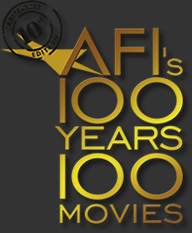 So whether you are looking for fun, educational or just plain random date nights, the AFI list is a great jumping-off point for your video queue or trip to the video store. Pair an Italian flick with homemade pizza and vino. Pick up some popcorn and Twizzlers for the old comedies. However you do it, it will be a fun night with your significant other, a group of friends or totally by yourself.